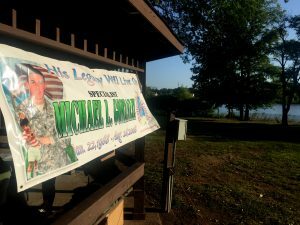 On September 10th, 2017 the Butterfly Circle of Friends had their 5th Annual 5k Race and 1 Mile Walk in memory of Michael L. Gonzalez. It was a perfect day to be outside. We raised over four thousand dollars for veterans and we couldn't have done it without all of those who ran and walked and we also couldn't do it without the generosity of our sponsors. All of the monies raised will help veterans get the assistants that they both need and deserve. Our focus when choosing a project to donate to are ones that helps soldiers get back on their feet. To help them to become independent self sustained civilians. Whether it's the homes we donated to the Save Haven Micro Houses for Veterans or sponsoring programs to help women veterans as we did with Vet Chat and Chew . The programs we sponsor are ones where soldiers get the tools they need so they can live their best life. Our other focus is and always will be to keep Michael's memory alive. We would like to thank all the participants that help make that happen and we would like to thank the sponsors for making this all possible.